I belong to a bee through the Rising Star Quilters Guild and we recently decided to give ourselves a challenge. We closed our eyes, drew a crayon from a large box, and were then to make a quilt inspired by that crayon. I have done this challenge twice now and I find it to be a great way to stretch a little because the Universe seems to hand you the color that you are least likely to use. In my case that color was “Shocking Pink,” the color of pink highlighters and many of the things my 4 year old daughter owns. As I started thinking about Disgusting Pink, I mean “Shocking Pink,” I first thought of colorful, tropical beach houses and then thought about Warholian Pop Art. 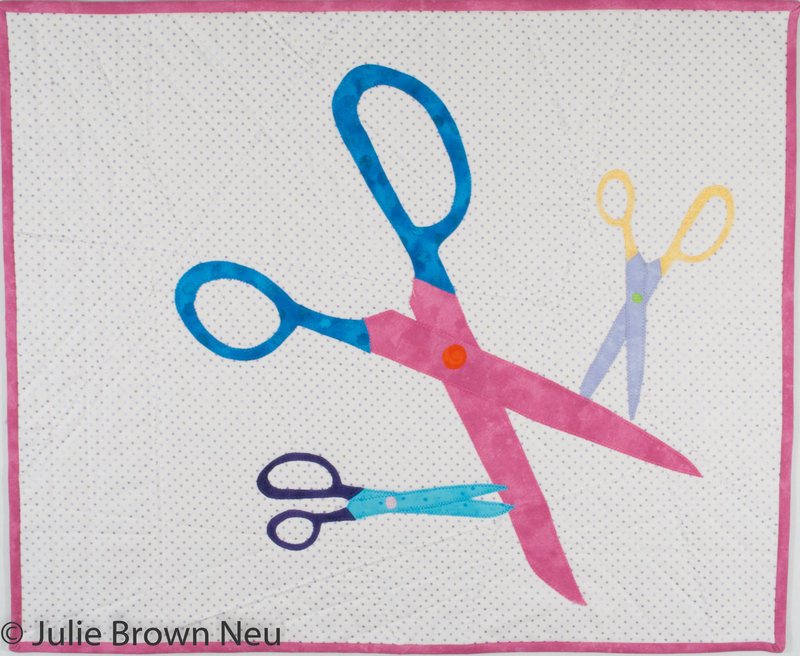 I thought next about a Pop Art topic that would be most relevant to quilting and the design for “Running with Scissors” began to form. I took a picture of a pair of scissors, printed it out and kept enlarging it until I got the scissors the size that I wanted. I then used the photo as a pattern for the fusible. Before fusing the scissors onto the background, I started to quit it. To make the quilt live up to its name, I started slicing the background quilt and then sewed it back together using large zigzag stitches. I then echoed the zigzag stitched pieces with straight quilting. As a last step, I fused the scissors in place and machine appliqued them with a smaller zigzag stitch in matching threads. It was a quick quilt to put together and one of the most fun mornings that I have spent in the studio in a while, all because I drew that blasted pink crayon. This quilt is now available for purchase in my Shop.